One of our aunts makes an olive oil cake that is truly excellent. She’s made a rosemary lemon cake and a fennel cake with a berry compote on top. Each time she’s made it, Leah and I have told ourselves to find a good recipe and make one on our own! Because an olive oil cake is healthy since there’s no butter…right? We will pretend that’s true for today. We baked our cakes in 3 mini loaf pans, since we are weird, but the recipe is intended for one standard loaf pan. We brought this on a picnic a couple months ago and everyone in our family loved it. 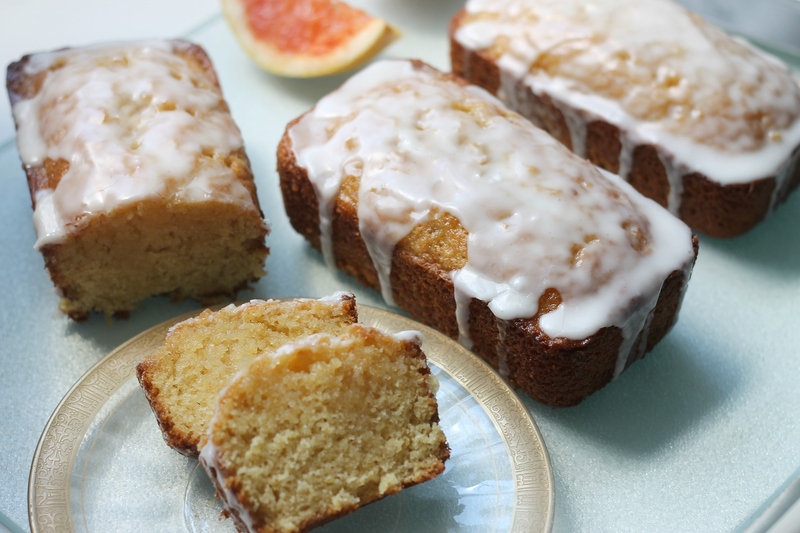 Grapefruit may seem like an unorthodox citrus choice for a cake, but have faith. It might be wise to double the recipe if you’re serving more than 8 people since this cake is good! There’s a slight earthiness from the olive oil, but the grapefruit flavor is bright and wonderful. This particular cake is very moist, particularly thanks to grapefruit syrup that is brushed over the cake after baking. It’s the perfect cake for serving when you are trying to escape the January good-produce-free vortex, since citrus season is here! Heat oven to 350. Butter and flour a standard loaf pan (or if you are a weirdo like we are, 3 little loaf pans). Rub together the grapefruit zest into the sugars by hand in a large bowl for a couple minutes to release the oils in the zest. Whisk in the oil and then whisk in each egg, one at a time. Scrape the sides of the bowl with a spatula. Whisk together the flour, baking powder, baking soda, and salt in a smaller bowl. Combine the 2 tablespoons of grapefruit juice with the buttermilk in a liquid measuring cup. Alternate adding the dry ingredients and buttermilk mixtures to the large bowl. Start and end with the dry ingredients. Put the batter in the prepared pan(s) and smooth the top. Ensure there are no air bubbles. Bake the cake for 45 minutes-1 hour, or until the cake is golden brown and a tester in the center comes out clean. Let cool for 10 minutes in the pan, and then transfer to a cooling rack. To make the syrup (do this while the cake is baking, towards the end), combine the sugar and grapefruit juice in a small pan and cook until the sugar dissolves. Poke holes in the still-warm cake and brush it well with the grapefruit syrup. Let it cool completely. Make the glaze by combining the powdered sugar, grapefruit juice, and salt in a bowl. Whisk until no lumps remain. Pour the glaze over the top of the cake and let set until you are ready to serve. Slice and enjoy!